Sometimes I’m delighted to be proved wrong. Usually that’s when I’m being pessimistic, as was the case when a restaurant in North Manhattan Beach closed and someone asked me to speculate about what would move in. “Something more expensive and aimed at an upscale crowd,” I answered. It was a safe bet based on present trends, but every once in a while the safe bet loses and a long shot pays off. Café Wild recently replaced Four Daughters Kitchen, was one of the few relatively inexpensive family restaurants in the area. Based on the name one might expect that whatever replaced it would be more pricey and aimed at an audience that came to party. The food would of course be esoteric and challenging, which explains the use of the word wild in the name. Anyone who made those assumptions would be wrong on all counts. Café Wild got its name because Phil Shipley, the cheerful English expat who owns the place with his wife Erin, is a Beach Boys fan. Their café was going to be called Wild Honey, but the name was shortened to Café Wild, presumably to avoid confusion with any apiary with a similar name. The freshly remodeled place is bright, casual, and serves comfort food to a family crowd. There’s a Union Jack outside, but with one big exception, the menu is California comfort food. They serve omelets, pancakes, and the like at breakfast, and burgers, tacos, and salads dominate the menu at lunch and dinner. 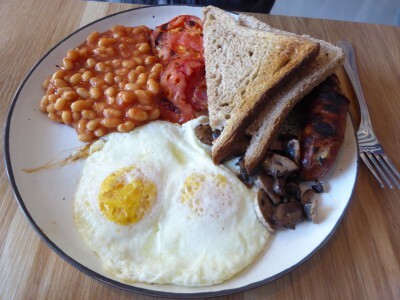 On weekends, they offer an expanded brunch that includes a full English breakfast. I’ll get back to that. The interior is furnished with low and high butcher block tables and metal patio furniture, functional though not particularly comfortable. There’s a small bar at one end where simple cocktails are served, but the feel is that of a café that serves the occasional drink rather than a watering hole. A small pastry case occupies a corner on the counter, and it’s worth a look as you come in because the items in it aren’t on the menu. This is a strange omission that has to be hurting sales, because if you see those pretty pastries at breakfast you’re going to want one. I had a kouign amann, the flaky Breton butter pastry that seems to be gaining traction in LA, and it made me want to eat my way through the rest of the case. The lunch and dinner items I’ve tried are a spicy fried chicken sandwich, a burger, and an order of tacos. The chicken sandwich had chunks of jalapeno that had been deseeded so that my lunch was flavorful but not explosive. The only fault I found was a bit too much of the aioli so that it was a messy meal. This is a problem because they serve their burgers on boards rather than plates, and after my meal arrived I was blessing the memory of whoever first invented the plate. The drips from the sandwich ran off of the board, onto the table, and toward my lap. I made a protective barrier of napkins to contain the flood and kept eating, wondering if an extremely persuasive cutting board salesman had been through while they were planning the place. It’s a fine platform for dry stuff like crackers and cheese, not so good for a juicy item. The burger was solidly made and decently sized, the carne asada tacos even better thanks to a layer of coleslaw with chimichurri and a topping of salsa that had cucumber and tomato plus some shredded beets. It really wasn’t like any taco I’ve had before, and it’s something I’d definitely try again. The fish and chicken tacos have different add-ins, and I’d like to try them all. If they offered a plate that had one of each it would be worth a premium. On the visit I ordered those tacos Phil stopped by my table and asked whether I preferred red or white wine. I told him to surprise me. He did when he brought half a glass of each, or maybe more than half a glass. It was a hospitable gesture and typical of the atmosphere here. As I mentioned, the restaurant serves a full English breakfast, which consists of eggs, banger sausage, English bacon, sautéed mushrooms, baked beans, grilled tomato, and your choice of toast or fried bread. The English breakfast has been credited with survival of the British people since if you lived to see one more dawn you’d get to eat another one, but some aspects may seem strange to Americans. For instance, English bacon would be called fried ham here – it’s from the loin rather than the belly so has almost no fat. (If you want American-style bacon in Britain you have to ask for streaky bacon.) The banger sausage is a mix of very finely ground pork with bread and mild seasonings inside a casing that snaps when you bite into it. As for the idea of having beans and grilled tomato for breakfast, all I can say is that you should try it. You may want to take an afternoon nap after consuming all that food, but it’s a delight. 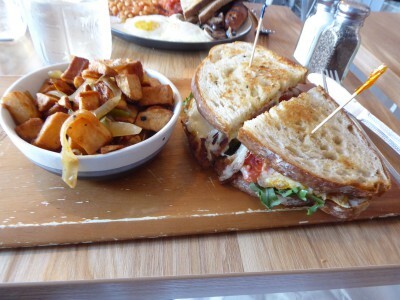 The other breakfast item we tried was a breakfast sandwich of fried egg, aioli, arugula, charred tomatoes, bacon, and Havarti cheese on grilled country bread, which was served with a side of potatoes. The sandwich was messy and delicious, but the potatoes had a strong flavor of bell pepper that overwhelmed everything else. I assume that you can get it without the peppers and if not, fruit is available at a slight upcharge. Regular and specialty coffees are available and are well made, and the latte is at least as good as that served at most specialty coffee places. 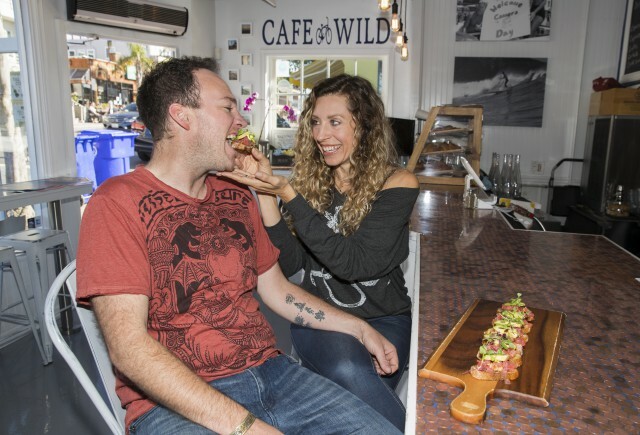 Based on the crowds on my recent visits, Café Wild’s strategy of serving modern comfort food with a few endearing eccentricities is a success. It’s popular with young and old, and already feels like a locals joint after only a few months in business.